Home equity is rarely tapped as a source of retirement income, even though most U.S. retirees have more money sitting in their homes than they have in their 401(k)s or IRAs. While many talk about downsizing, relatively few actually do it. And only about 60,000 retirees took out a reverse mortgage in fiscal 2013, according to the U.S. Department of Housing and Urban Development. One reason may be that reverse mortgages are an unfamiliar and complex financial product, and their costs, benefits, and risks are poorly understood. To guide consumers about federally insured reverse mortgages, regulators require that homeowners meet with a government-approved housing counselor to apply for a loan. Many retirees hold on to their home equity to pay future medical bills or pass something on to their children. Maybe it’s time to consider how to convert that equity into income. 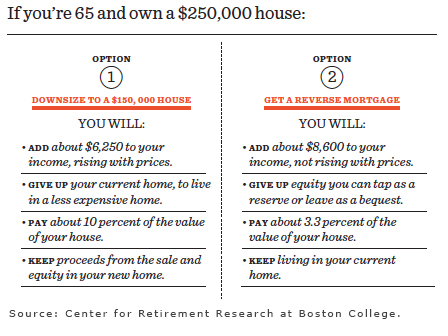 The downsizing example leaves out the mortgage that may be outstanding. The reality of downsizing is finding an acceptable residence within a reasonable distance from the grandchildren. If you live in the northeast, property taxes are eating up a fixed income. I agree with Paul. I live in the Northeast, and the taxes are outrageous!! Recently, we started the process of finding a more cost-effective place to live in California and tap in to all the equity value we had accumulated living in the San Francisco area. We found a great community about 2 hours away called Rancho Murieta. Highly recommend it to Californians who want to stay in California but increase their quality of life.